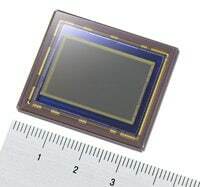 Tokyo, Japan - Sony Corporation today announced the commercialization of "IMX021", an APS-C size (diagonal: 28.40mm/Type 1.8) 12.47 effective megapixel ultra-high speed, high image quality CMOS image sensor designed to meet the increasing requirement for rapid image capture and advanced picture quality within digital SLR cameras. Sony will position "IMX021" as a key device capable of generating new added value in the high-growth digital SLR camera market, actively promoting its use within Sony and externally. One of the main strengths of CMOS image sensors is their potential for system integration, enabling both analog and digital circuits to be combined on the same chip. "IMX021" maximizes these advantages, while also incorporating Sony's newly developed "Column-Parallel A/D Conversion Technique", providing each column within the sensor with its own A/D* converter. This system enables analog signals transferred from the Sensor's vertical signal lines to be A/D converted directly, over the shortest possible distance. It also minimizes image degradation caused by the noise that arises during analog processing, while at the same time delivering an extremely high signal conversion speed (in all-pixel scan mode) of 10.39 frame/s (12 bit). The "Column-Parallel A/D Conversion Technique" aligns both digital and CDS* circuits alongside each column. Column-parallel digital CDS circuits reduce not only pixel noise, but also the noise and inter-column processing variations that can affect analog CDS circuits. These circuits also limit A/D converter fluctuations. With this dual noise cancelling technology realizing high-precision noise reduction across both analog and digital circuits, the "IMX021" image sensor allows signals to be transferred, with limited noise, to the image processing circuits of the camera unit itself. This makes it ideally suited for the development of high image quality digital SLR cameras. "IMX021" production will be carried out at Sony Semiconductor Kyushu Corporation's Kumamoto Technology Center.